During a decade historic for change and innovation, it was an event that shook the innocence of pop music concerts into the sophistication of stadium rock. It was ground breaking and electrifying. It was a happening before the term happening was groovy. It survives in the memory of anyone who was there to experience the excitement, thrill, mania and love surrounding four young men who defined an image and created the soundtrack for a generation that came of age in the 1960s. For fans, associates and the innovators themselves, the echoes from a hot summer night in New York still resonate through the years. See below for 20% discount on author signed books and FREE shipping! On August 15, 1965 is one of the most exciting and important concert events in the history of popular music. Produced by Sid Bernstein and introduced on stage by television legend Ed Sullivan, John, Paul, George and Ringo played, sang, sweated and laughed for a record crowd of 55,600 fans. It was the height of Beatlemania and launched the modern era of outdoor stadium shows. "The Beatles At Shea Stadium" tells the story of this concert through researched commentary and exclusive interviews with Beatles insiders, friends and fans. The story begins in 1963 with Bernstein scheduling the then-unknown group for two concerts at Carnegie Hall and the first wave of U.S. Beatlemania. Follow events leading up to the concert as the Beatles arrive in New York, tape "The Ed Sullivan Show" and attend a never-before revealed dinner at Rockefeller Center. Then go backstage as they nervously prepare to face their largest live audience. "The concert and excitement surrounding the performance is described in amazing detail based on unedited live recordings and eyewitness accounts which appear throughout the book, including hundreds of little-known facts about the TV special produced by Ed Sullivan which aired on ABC, as well as the secret recording session to overdub the live audio for network broadcast." "In this new book, author Dave Schwensen focuses solely on this Beatles concert and the history surrounding it. What follows is a fascinating book that chronicles the entire life cycle of this legendary show, from its inception to its execution and aftermath." "'The Beatles At Shea Stadium' offers multiple and valuable perspectives. Recollections from audience members, the concert photographer, a reporter and DJs put the reader at the scene, effectively presenting a complete picture of the sights and sounds of the humid New York night. Schwensen wisely stands aside and lets his subjects tell their stories... These figures reveal small moments such as Ringo Starr sitting alone on a bench signing autographs, and George Harrison anxiously peeking out onto the stage to witness the ecstatic crowd." "The book reveals everything one would want to know about the historic concert, from the weather to the songs to the sound system and marketing. 'The Beatles at Shea Stadium: The Story Behind Their Greatest Concert' makes a welcome addition to any Beatle fan's library, as it fills in a significant knowledge gap." "The book contains in-depth research and fascinating interviews with those who were there and others who were connected to this historic concert, including promoters, DJ's, record company executives and of course some of the many fans who were at Shea Stadium that night. All that's really missing is the screaming." "Dave Schwensen has tackled two of the most complex and diametrically opposed concerts of The Beatles' career: the most successful, Shea Stadium, and the most "eventful," Cleveland. And he treats each with equal respect and scholarship, allowing the reader to see the "good, the bad, and the ugly." These two concerts were career landmarks for The Fab Four, and Dave gives both events the research and serious consideration that they richly deserve. Bravo for a job well done!" 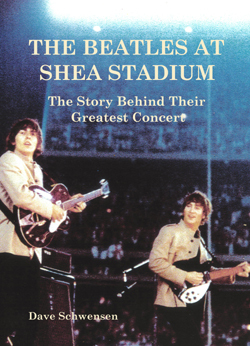 Purchase author signed copies of The Beatles At Shea Stadium for $19.96 - 20% off the retail price of $24.95 - and receive FREE shipping anywhere in the continental United States. Email debbie@northshorepublishing.com for mailing rates outside continental U.S.